Sail area in the jib has been scientifically assessed to be twice as effective in producing drive to windward as sail area in the mainsail. This is directly related to the fact that the jib has a clean leading edge, whereas the leading edge of main is compromised by the presence of the mast. But the efficiency of the jib drops dramatically as soon as the jib sheet is eased out, because leech tension is immediately lost - the top of the sail twists off with a direct loss of power. And dead downwind the jib just slats around and makes a nuisance of itself. The Hoyt Jib Boom corrects this by doing for the jib what the boom vang does for the mainsail - holding down the clew, maintaining leech tension, and thereby creating an efficient offwind sail. The block at the end of the boom provides 2:1 power, which eases the trimming load, and dead downwind the boom becomes a built in, self jibing whisker pole. The following quote from an expert owner neatly summarizes the advantages of the HJB. "I have used the Hoyt Jib Boom for three seasons on my 38 footer and I love it. It makes the headsail supremely easy to handle, giving full control at all times. To me, the most outstanding feature is its 'kick effect' ensuring efficient sail even when one starts to ease the sheet. Never again that hopelessly twisted leech - it's like having an invisible sheeting point out on the water. A marvel! I consider the Hoyt Jib Boom to be by far the best idea that has come out in many, many years." Forespar offers a retrofit kit for owners of existing yachts wishing to upgrade to the Hoyt Jib Boom. 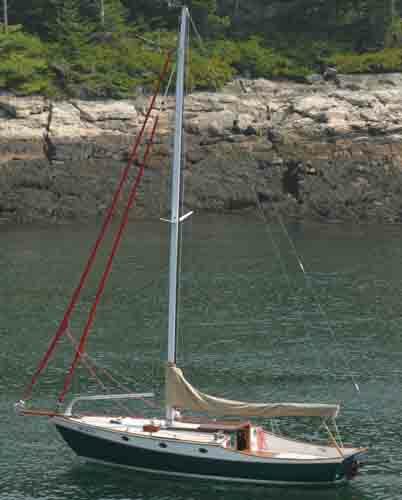 The Hoyt Jib Boom is shown installed on a yacht in the picture to the right. Information on this kit from the Forespar web site can be viewed by clicking here.